A few weeks back, I shared my Mediterranean Tilapia recipe with y’all and it seemed to be well received. It’s been a busy few weeks, and I just realized I never did tell y’all what to do with the leftovers! I re-mixed the four leftover tilapia fillets and made some scrumptious stuffed mushrooms. No breading, all fish, vegetables, and cheese. Preheat oven to 400 degrees. If you haven’t already, wipe your mushrooms clean with a damp paper towel. You never want to submerge them in water or wash under running water, as this will make them water-logged. Spray a baking sheet with cooking spray and place the cleaned mushroom caps on the baking sheet. In a non-stick skillet, heat the olive oil and butter substitute together on high heat until the butter melts. Add the onions, peppers, zucchini, and spices. Saute over medium high heat for about 5 minutes, until onions are translucent and vegetables are tender. Stir in the lemon juice right at the end of cooking. 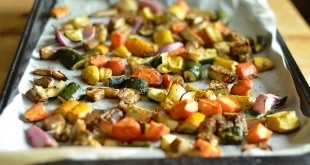 Remove pan from heat and let the vegetables cool for at least 8 to 10 minutes. In a mixing bowl, beat the egg and whisk in the protein powder if you are using it. 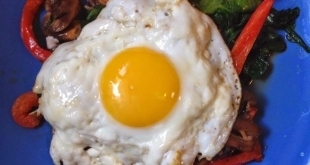 Break the tilapia up into small bite-sized pieces, then add it to the egg. Stir in the vegetable mixture and 1 cup of the cheese, until all ingredients are combined. Spoon the mixture into each mushroom cap until they are all filled. Bake at 400 degrees for 15 to 20 minutes, until the mushrooms are done. Remove the pan and top each mushroom with a sprinkle of the reserved cup of cheese. Return the mushrooms to the oven for another 5 minutes, or until the cheese melts. Serve warm. Not a mushroom fan? Skip the ‘shrooms and just put the stuffing mixture into ramekins and bake. It’s just as yummy, well except for the scrumptious fungus! Serve a salad on the side and it’s elegant enough for a fancy dinner, no one will even know it’s leftovers! is there somethin in this recipe you could substitute for the egg? daughter has severe egg allergies. Hi Jaime! The eggs are a binder so you can omit them. The cheese also serves as a very good binder. If you use it as a binder, I'd say use about a 1/4 c. more of it for good measure. After all, there can NEVER be too much cheese, right? Made these, absolutely delicious, and filling! Hi my name is Rebecca. I just want to say, I LOVE THIS WEBSITE!! I love to cook and come up with new recipes. I had my surgery in May of this year and have been wondering how to revamp some of my familys holiday standards (new years eve has always been known as pig out in my family) so that it would be more healthy and have some things I can heat without guilt. Your website has been very helpful. I tried these stuffed mushrooms last night and they are officially on the menu for Pig Out. I have also told all my friends about your website. Hi, thank you so much for this recipe!! Fantastic! Side note – I REALLY, REALLY enjoy reading your blog. You are so witty! 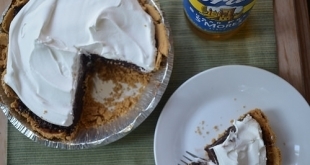 I told my husband that even if I never tried a recipe, I’d read your blog just for the laughs. But your recipes are fantastic, so it’s a major bonus! Thanks for all!